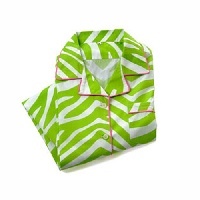 Cuddle up in style with the Ibiza Collection Nightshirt in Zebra by Toss Designs. This bold and fabulous shirt features a ferociously cute animal print that will keep today’s chic woman looking simply marvelous all night long! The zany green and white zebra print is beautifully accented with a vivid pink trim that gives you the style you strive for. The large buttons up front and sassy French cuffs make this night shirt the ideal gift idea for the women in your life that like to unleash their wild side from time to time! Available in Large/X-Large or Small/Medium. All items in the Ibiza Collection are designed to accent one another. This safari chic collection puts a fresh twist on the traditional zebra pattern.